Whether you are looking for popular art or simply admiring the fabulous canvases of Ecuador's greatest artist Guayasamin, a special excursion can be organized for you. Ecuador offers a few but rather sophisticated sculptures as well as mural art. Quito and Cuenca boast the best preserved colonial and republican buildings in South America. Baroque and neo-classic architecture are a well worthing visit. Ask us about this topic. The famous quitenian school of art rendered amazing pieces of religious art from the 17th and 18th centuries. Most of these remarkable works can be found in the colonial churches and monasteries, specially in Quito and Cuenca. 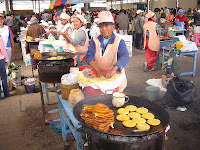 Ecuador has many different traditions depending on the region and time of the year, where you are. We can match some of them with your trip to give you a great insight about the ecuadorian culture. One of the most interesting ways to experience Ecuadors culture is through its handicrafts, weavings, panama hats, etc. Why not bargaining some articles in the bustlings indigenous markets and bringing them home? Every region has its own music and dance styles, therefore is hard to think on a unique music that best describes Ecuador. Come and discover it by yourself. For the people that dare to try some sophisticated national dishes such as seco de chivo, guinea pig, or a delicious ceviche. Maybe not world wide known artists but in Ecuador live some talented, innovative and creative artists. During your excursion you visit some galleries and ateliers, simply the most valued way to get to know the artists and their work.